What is the Best Hybrid Car? The people spoke – and Toyota listened. They did more than listen, they acted. 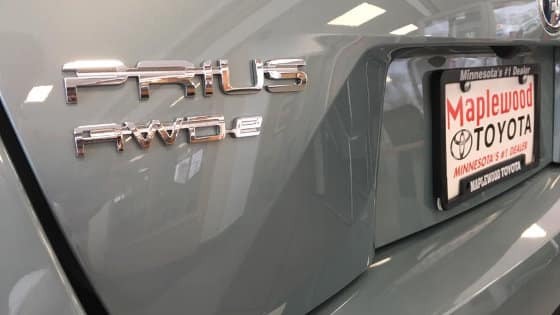 The 2019 All-Wheel-Drive Prius Hybrid car is here! Toyota Prius AWD is the most fuel efficient of Toyota vehicles and on its way to becoming a best hybrid car with a rating of 52 hwy, 48 city and 50 combined miles per gallon. 50 mpg AND All-Wheel Drive? You can’t beat that. Toyota’s all-new AWD-e system is a revolutionary magnet-less system. It powers the rear wheels from 0-6 mph then as needed up to 43 mph. One big reason the Prius gets good mpg is an ultra-low 0.24 coefficient of drag, which is among the lowest of current production passenger cars. Automatic grille shutters reduces drag by closing when airflow to the radiator is not needed. Even the air conditioning system, which uses a quiet electric compressor, works intelligently to maximize energy efficiency. The Smart-flow mode directs airflow only to seated occupants to conserve energy and maximize comfort. Utilizing the stalwart Nickel-Metal Hydride (Ni-MH) battery, the AWD Prius will be resilient in cold-weather conditions, and sustain its notoriously long life. With 62.7 cu. Ft. of carrying space, the All-wheel drive Prius can haul more than some small SUV’s and even more than most full-size sedans. All 2019 Prius models, including the AWD Prius, come standard with Toyota Safety Sense P (TSS-P). TSS-P provides the latest in safety technology including: Pre-Collision System with Pedestrian Detection, Lane Departure Alert with Steering Assist, Automatic High Beams, and Full-Speed Range Dynamic Radar Cruise Control. Standard LED head lights and LED tail lamps reduce energy consumption, while giving better light and having a longer service life. Could the New 2019 Toyota Prius Hybrid AWD actually be the best hybrid car in its class? We think it is but you’ll have to judge for yourself. Come take a test drive and find out why this new hybrid car makes sense. 0 comment(s) so far on What is the Best Hybrid Car?